Handbells are just what they say, bells that are rung by hand. 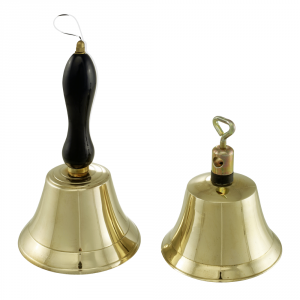 In order to achieve sound, the user grasps the handle and moves the bell vigorously in an up and down motion. They come in different shapes and sizes. The material from which they are made is also diverse, each material creating a different sound to the other. They can be used to draw attention, attract a crowd or even as part of a musical ensemble. The Cor brothers were the first to develop tuned handbells. This was in the period between 1696 and 1724. These were fitted with hinged clappers that allowed them to move in one place. They were finely tuned to have a basal tone. Tuned varieties were originally used by bell tower ringers to practise their various sound sequences without disturbing the general public. The ones used by these bell tower change ringers incorporated the same number of bells found in the tower and they were tuned to a diatonic tone. Margaret Shurcliff introduced them to the United States in the year 1902. They were her reward for completing two lengthy change ringing peal in the space of one day. The development of rhythm is greatly enhanced by playing these musical instruments. The technique requires listening skills and physical coordination. Children are introduced to reading music through taking part in these choirs. It is a fun way to incorporate learning, honing their developmental skills and creating something that is amazing. In many schools where an ensemble is part of the school schedule, colour coordinated bells are used to assist children in the learning process and to allow them to master the skill with ease. Of course, as with any music, a certain degree of passion and enjoyment is required.